After all of the build up to the March in March, I nearly ended up not marching at all. 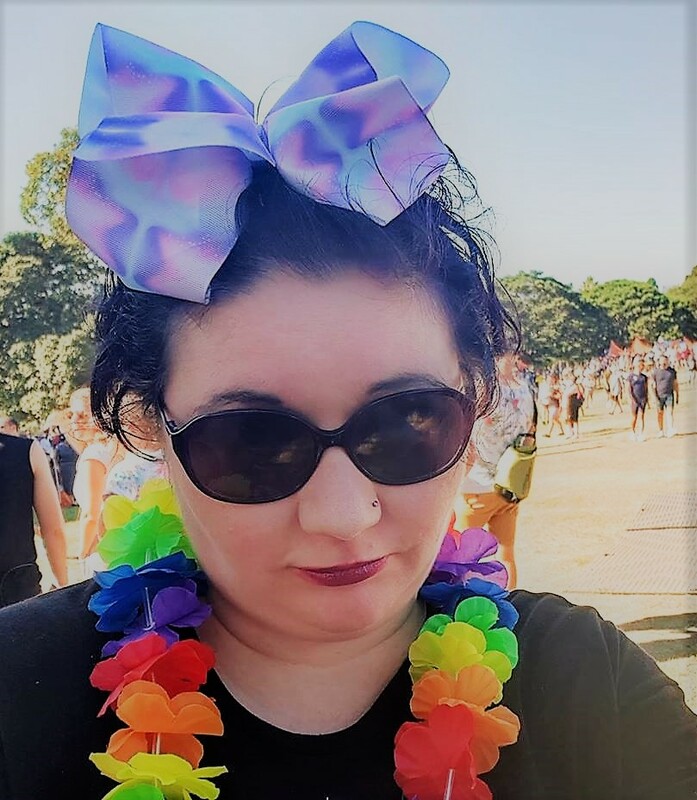 First I was supposed to be marching in Newcastle, then it looked like we'd be in Sydney, then Sydney was cut short but I was having niggling health issues and considered staying home. But heck, I'm the "ordinary Aussie wife and mother", mentioned in Jenna Price's Canberra Times article on the march (about the only MSM coverage ahead of the event), I had to be there; I knew I'd always regret missing it. So DH, Baby G and I set for the Newcastle march on Sunday morning. We'd no signs, unfortunately; I'd been away for the few days prior, but the main problem was I couldn't think up any witty, yet peaceful and family friendly, slogans. The closest I got was BRO'S BEFORE EMBRYOS, which lacks a certain punch. 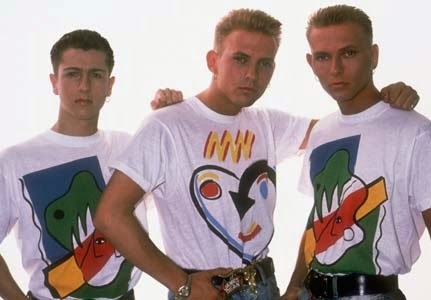 Also, it required me to insert an erroneous apostrophe, which goes against everything I stand for, but I didn't want anyone to think I was referring to the 1980s Scottish boy band Bros.
Mr Abbott, who are you leaving behind? 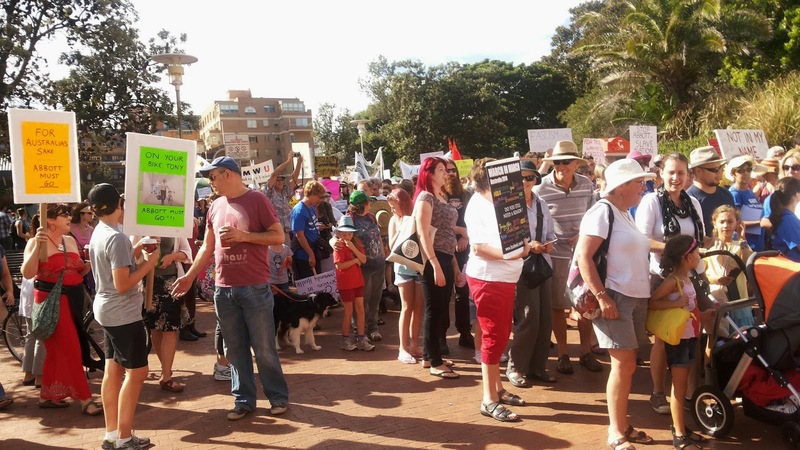 The Newcastle march assembled in Pacific Park, in the east end of the city near the beach, to march towards the heart of the city at Civic Park opposite Town Hall - a distance of about 1km. We bussed it in, and were extremely gratified to see the bus was packed, with a bunch of other people heading to the march. This was going to be BIG. When we arrived at Pacific Park just before heading off, there were people packed in as far as the eye could see. We attended the rally against a fourth coal loader in the port of Newcastle, and that was pretty big, but this was huge, and very exciting. The crowd was a real mix - old and young, plenty of people with their kids, unionists, students, workers, parents and grandparents. Ferals? I saw maybe one or two, whatever they are. 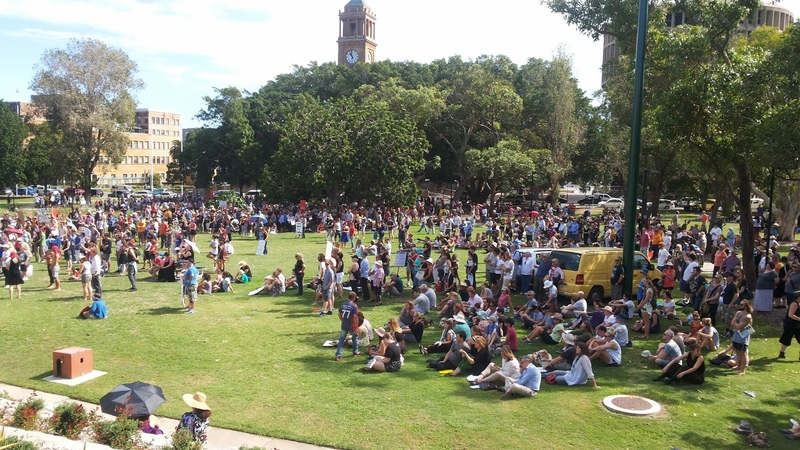 But there were thousands of ordinary, peaceful Australians proud of their country and dismayed at the path the current government is taking us down. Out of some 4000 attendees, I saw no threats, no crude cartoons, no effigies. The only thing I saw which made me frown a bit was the hammer and sickle of a communist flag. Communists have a right to have their say, just like anyone else; I just worried about it being misconstrued as representative of the whole march. Of course there was a lot of that going on, but more of that later. The vast majority of those marching were just ordinary people like, well, us. 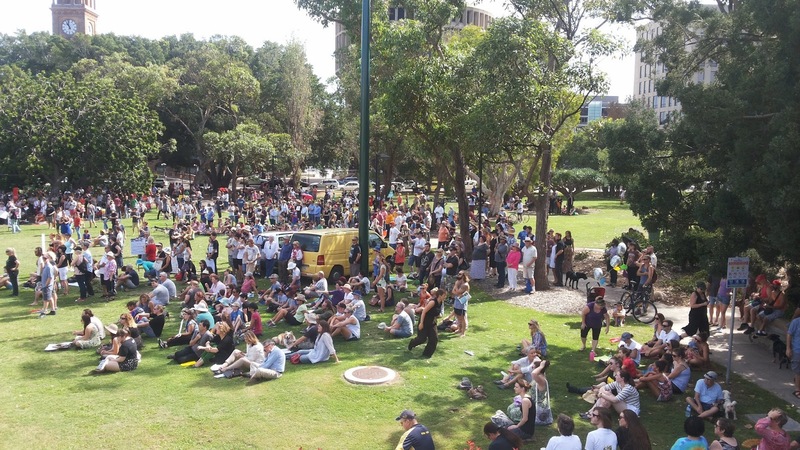 There was so much buzz about the march on social media in the lead up, but I wasn't sure if it would come to anything, especially in a regional area like this - whether there may be a few hundred straggling people. So to see the crowds packed in, to feel the atmosphere, was electrifying - so many people rolling up early on a Sunday morning, ready to say to the government no, you do not govern in our name, you do not have our silent consent. Alone, we may be lone voices in the wilderness, but when we combine our voices, things can happen. 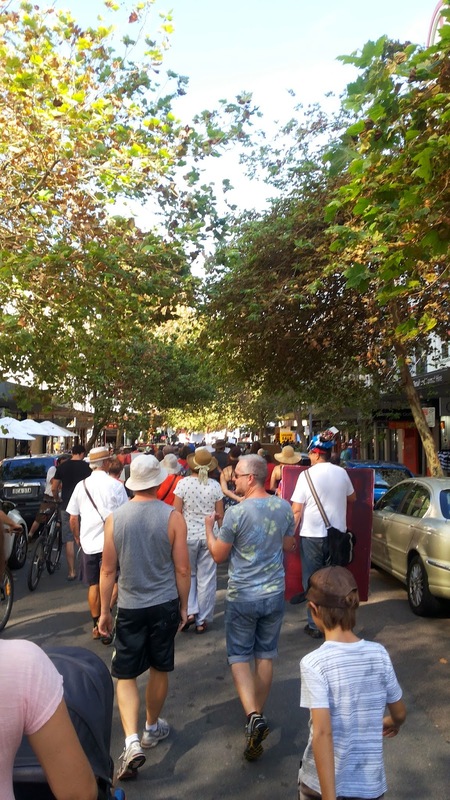 It was thrilling to see the march packing the length of the Hunter St mall. By and large, it was pretty quiet; occasional chants of "hey hey, ho ho, Tony Abbott's got to go" and the like, which sent Baby G into frenzied dancing on his Daddy's shoulders, to the amusement of the general vicinity but not much more than that. 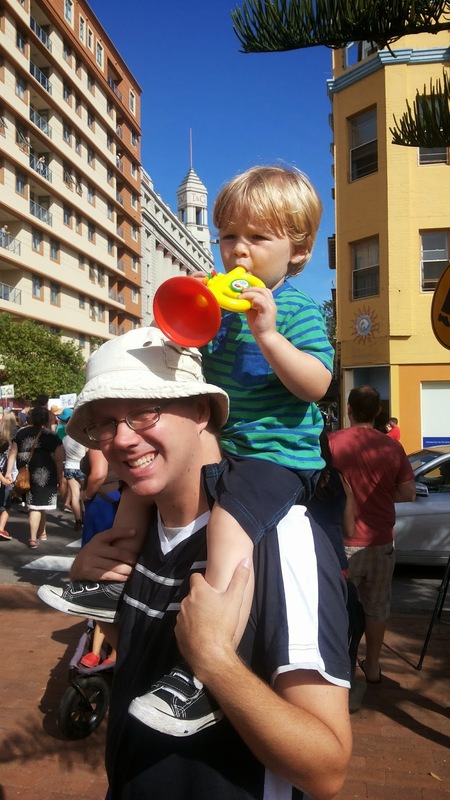 (Incidentally, we were asked was this Baby G's first protest. No, I said, he's marched for equal pay, and been to the opening of Occupy Sydney, and against a new coal terminal, and...well, this is in his first ten, anyway). I didn't witness a hint of menace, no violence, never felt threatened. There was a small contingent of police and an ambulance, but they kept their distance and weren't much required. 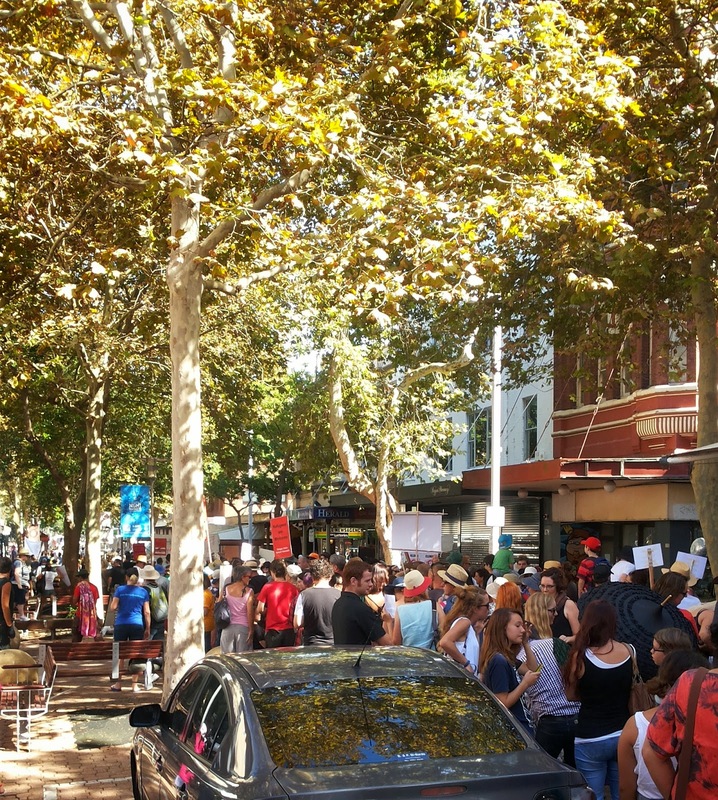 What was exciting was as the march came out of the mall and turned onto Hunter St, drivers beeping, people coming out of their flats and shops to cheer us on, and even train drivers sounding their horns in support. then the speeches got underway. I'm still heartbroken by the loss of the fig trees above Civic Park, but I have to admit it forms a great venue for speeches and events now, an unintended amphitheatre. These photos don't really give a true sense of the size of the crowd. It was very hot in Newcastle yesterday - nearing 30 degrees at 11am - and a lot of people were clustered under the trees at the back. I've had my outs with Newcastle lately, so this restored my faith, I was so pleased and proud to see the city turn out. Unfortunately I still wasn't feeling tremendous, and it was getting hotter and hotter, so we bailed, and I spent the rest of the day thrilled to read reports of other marches, that despite the lack of media coverage in the lead up, so many people had organised, come together, spoken out. So of course the backlash soon began. The right could only dream of such attendance in their wildest dreams - given that they are fundamentally lazy, they really should be terrified of the abolition of compulsory voting - and lashed out. We were ratbags and ferals - standard terms of insult, overused to cliche. We didn't respect democracy, announced people who fail to understand that democracy lasts beyond election day and includes the right to free speech, free assembly and peaceful process. We should go back to Russia, announced those who seem to have missed that Russia abandoned communism 24 years ago. The majority of Australians spoke on election day and we need to get over it, proclaimed people who seem oblivious that things have moved on since then. As the right on social media moved themselves to apoplexy, none of this came as a surprise. What was slightly surprising, and disappointing, was the lack of coverage in the mainstream media. By the smallest estimates, over 100,000 people marched yesterday. Alan Jones' pathetic "convoy of no confidence" had more journalists than attendees so where was the reporting of yesterday's march? When do 100,000 people participate in anything else that is almost completely ignored? 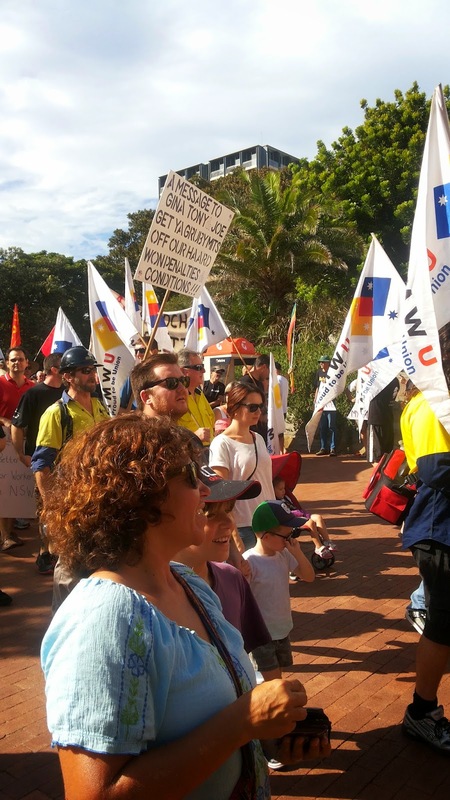 ABC NSW's TV news bulletin was the only MSM outlet to provide even halfway decent coverage - reporting tens of thousands marched Australia-wide in a vote of no confidence in the government. 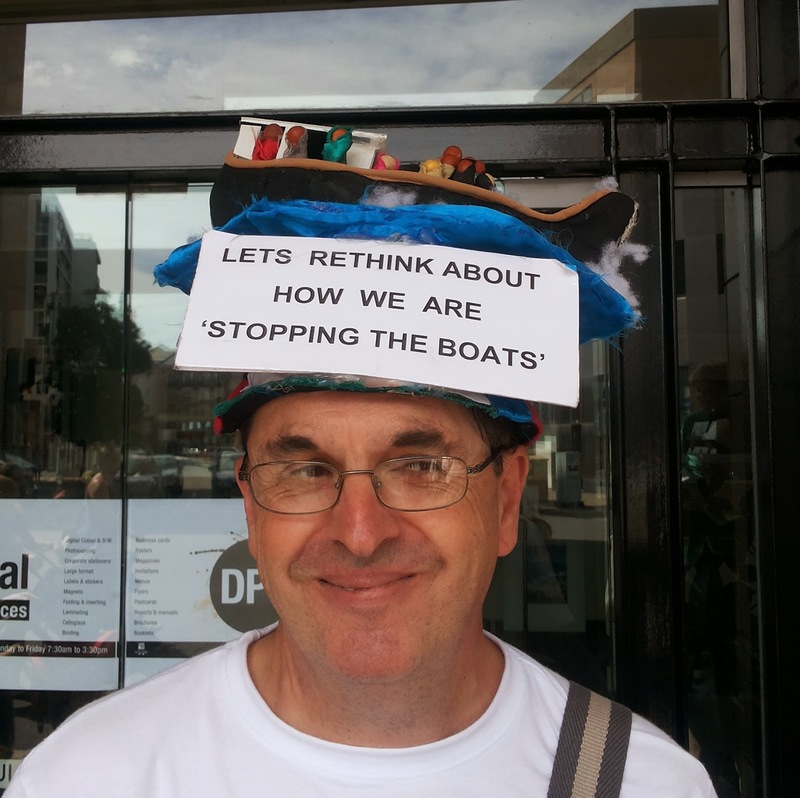 As for the rest, it ranged from pathetic - the SMH reporting marchers numbered in the hundreds and had links to the illuminati - to the outraged, with Andrew Bolt posting pictures of signs he took offence at, branding the marchers hateful and deranged. When I saw the signs calling for Tony Abbott to be killed I thought "oh no, the media will be all over this". And I certainly don't want Abbott to be killed. Resign yes, and go into a deep, media free retreat to write books of his far right ramblings. I don't approve of those signs. And most of the other marchers don't, either. The organisers of the march repeatedly asked people to keep signs respectful, family friendly and peaceful. And it's worth remembering those signs were held by a tiny handful of participants (again, apart from a handful of F*CK Tony Abbott t shirts I saw no such signs amongst the 4000 marchers in Newcastle). There were no effigies, no violence, only a very few arrests. Show me another gathering of so many people with so few arrests. Ahead of major events, police repeatedly call for no drunken violence. Are the police then to blame if the violence break out? Of course not. March organisers wanted a peaceful march. Of course opponents and naysayers will focus on the few offensive signs; they're too terrified to contemplate the larger issues here. 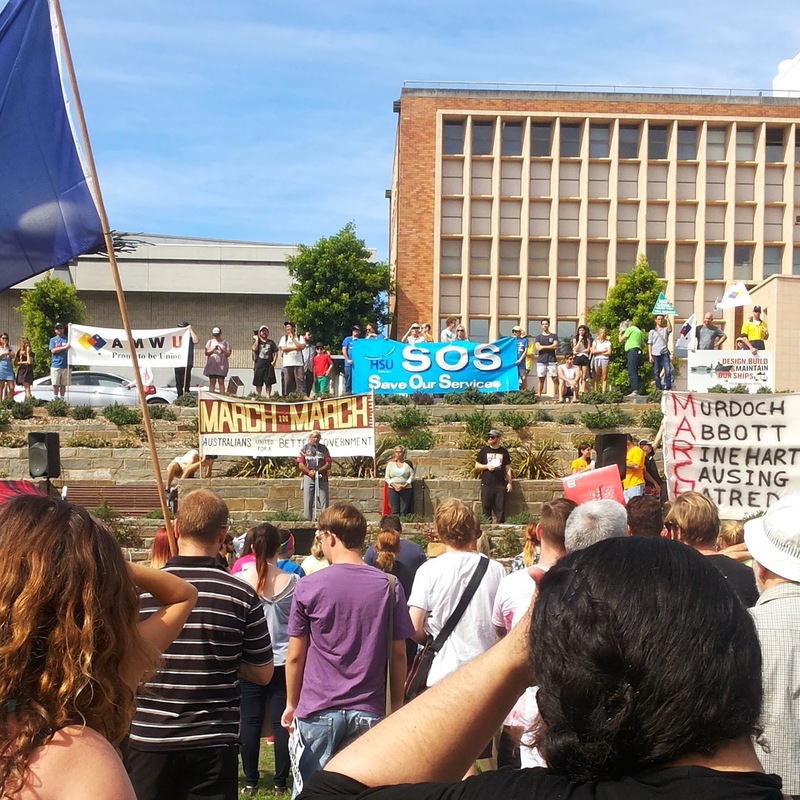 To say a few rogue protesters with signs condemned by the majority is comparable to Abbott giving a speech under a sign saying "ditch the witch", well I think that is so ludicrous as to be beyond any serious consideration. That's the difference between right and left wing violence in Australia. Lefties are isolated, from the bottom up (and it rarely gets very far up). Right wing violence is institutionalised, from the top down. Anyway, the culmination of the weekend of protests is the main March on Parliament House in Canberra today. I wish I could be there, and send my best good wishes to all who are attending for a peaceful, inspiring march. We won't be going away. They can't ignore us forever.